Dave & Buster’s, one of the nation’s largest restaurant and arcade chains, decided to open it’s first store in the Pacific Northwest in Boise, Idaho. 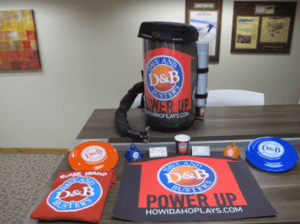 While Dave & Buster’s uses a national media buying company for large-scale TV and newspaper buys, they like to hire a local public relations agency to take care of building buzz and getting people to the grand opening event. The client’s goal was at least 800 people in attendance at the opening event. Red Sky decided that one of the best ways to tap into the Boise market was to partner with local non-profits. We ended up working with three fantastic charities: The Idaho Humane Society, Life’s Kitchen and Special Olympics Idaho. Red Sky set a price point of $25 per ticket for the grand opening, which included all-you-can-eat food, two drinks and $20 in game play. 100% of the ticket sales went to the local NPO’s and the buyer had the choice of where their money went. Each of the participating non-profits was required to post regularly about the grand opening event on their social media pages, as well as promote through at least one e-newsletter. Red Sky set a goal of selling 400 tickets to the event this way. In addition to selling 400 paid tickets for charitable causes, Red Sky also set a goal of having 400 VIP guests at the event. VIP guests received complimentary access. The VIP guest list included people from all around Boise involved in the world of business, government, local celebrities (radio personalities, Boise State University coaches, etc.) and general movers-and-shakers. Also included were prominent Twitter users, given social media’s prominence in Boise and influential reach. As many street team-attended events were outdoors during wintertime, each group carried two “jet packs”— a supersized backpack thermos filled with hot, local coffee at the events; it was a huge hit! 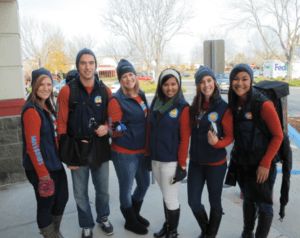 The street team consisted of nine members, almost all were Boise State University students eager to promote Dave & Buster’s. Depending on the event, we had 4-6 street team members present. In addition to other events, we had the street team at one event for each of our three participating non-profits. For the Idaho Humane Society, this was the “12 Strays of Christmas” event, which Dave & Buster’s sponsored. For Life’s Kitchen, the team participated in the December Food Truck Rally at the Boise Outlets. Dave & Buster’s also sponsored this event. For Special Olympics Idaho, the team was a part of the “Turkey Day 5K” on Thanksgiving morning. In addition to packing the grand opening, Red Sky was also tasked with garnering media coverage for the event. 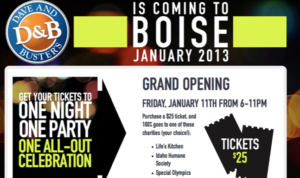 Red Sky secured coverage in nine Boise media outlets covering Dave & Buster’s, both before and after the event. Red Sky secured approximately 10 prominent Boise “tweeps” to attend the media sneak and tweet about the event. Ticket sales went through the roof during the last week before the event; after selling the original 400 we bumped the sold tickets up to 550, which were all gone a few days before the grand opening. 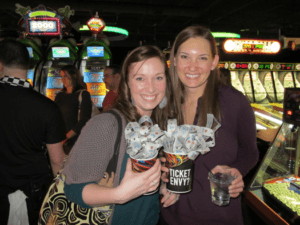 The initial goal of 800 attendees at the event was blown out of the water; Dave & Buster’s saw over 1,100 people through its doors opening night!